Y Plas at Y Plas Machynlleth01654 702571work Historic HouseThis mansion formerly belonged to the family of the Marquess of Londonderry. The house which stood here before their ownership was known as Greenfield and existed by 1673. The Londonderry family changed the name to Y Plas ("The Mansion") and greatly enlarged the house. Some of the original structure may have been incorporated in the building we see today. The imposing façade dates from 1853. Guests who visited Y Plas included the Prince of Wales, later King Edward VII. The extensive grounds were landscaped according to changing fashions. Decorative gates and two lodges were installed at the entrance when the site was enlarged in 1853. In 1948 the property was given to the town for use as a public park. The building became offices of Machynlleth Urban District Council, which was replaced by Montgomeryshire District Council in 1974. In 1995 Montgomeryshire council began a £2.5m renovation of the mansion, to create a Celtic-themed visitor attraction called Celtica. The council was abolished in 1996. In 2006 Powys County Council closed the attraction, which had never attracted enough visitors. In 2008 the building, known as Y Plas, was acquired by Machynlleth Town Council. It now features an art gallery, shop and café. Y Plas also includes office and conference facilities, and a 250-seat community hall. The town council's chamber and office is also situated in Y Plas. This mansion formerly belonged to the family of the Marquess of Londonderry. The house which stood here before their ownership was known as Greenfield and existed by 1673. The Londonderry family changed the name to Y Plas ("The Mansion") and greatly enlarged the house. Some of the original structure may have been incorporated in the building we see today. The imposing façade dates from 1853. Set in its own beautiful parkland and overlooked by rolling Hills. 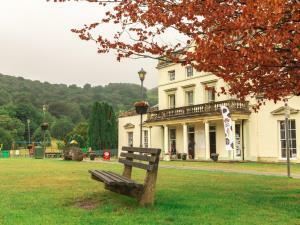 Plas Grounds open 7 days a week.